Utilising our large format direct printing methods, the garden plans and photo images were printed to large foam PVC sheets and placed in the tent along with the printed roller banners and leaflet holders produced by GJ Plastics. The intended design is of a landscape with water represented by gravel, rivers by slate and mountains by large boulders. Planting will complete the garden to create a beautiful landscape scene. In using their imaginations, you can become absorbed in the scene and perhaps for a short time enjoy the peace and tranquillity. In this sense gardens representing landscape such as Japanese gardens can be experienced as ‘healing’ gardens. 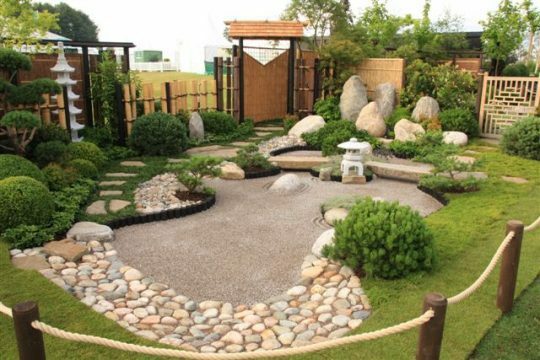 Consisting of two parts, one part being a Japanese style garden with rocks, gravel, pruned trees and lanterns, whilst the other is more a traditional English style with a lawn, decorative shrubs and ornaments. The designed garden was then produced to the plan by the society for the RHS flower show at Tatton Park. We are very pleased to say the judges awarded the gold medal in the large garden category of the show. After the show volunteers from the society will transplant and extend the garden to a much larger version to its location at the new hospice in Rochdale Old Road, Bury. Japanese Garden Gold Medal winner Tatton Park.